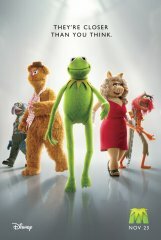 Disney and Fandango have released the first official poster for their upcoming film “The Muppets.” It comes with the tag line saying, “closer than you think,” and a picture of Kermit shoving his crotch in your face… I dunno about you, but the poster is a little bit unsettling as we get to see everyone in full stride, something that we rarely get to see in the past. “The Muppets” hit theaters on November 23. It star Chris Cooper, Jason Segel and Amy Adams, and will feature cameos up the wazoo including Zach Galifianakis, Billy Crystal and Jack Black.